This is the view up the valley from Tanijyugo. I live on the other side of the mountain on the left. Which has nothing to do with this post except that it is a photo of Japan, and the good folks over at JapanVisitor are having a Japan Photo contest. The Otoshi Shrine in Hamada is built on a small rise overlooking the harbor. The shrine looks abandoned, but the usual stack of rakes and shovels used to keep the grounds clean can be found at the side of the main building, and a friend tells me he has been here to watch kagura in the kagura-den. Otoshi is one of Susano's sons, and is primarily associated with rice growing. There is a secondary shrine to Inari, a very small Ebisu shrine, and a Sumiyoshi Shrine within the grounds. Behind the shrine is a small Benten shrine. The head Sumiyoshi Shrine is in Osaka and is associated with safety on sea journeys. Hamada was the provincial capital of Iwami, and as most travel in ancient Japan was by sea I suspect this was where officials from Yamato would arrive. The shrine was built on the site of a much older shrine. In the 8th Century an Awashima Shrine was built here. Now a small Awashima shrine is located in the temple next door. Awashima shrine is in Mie, near Ise, and is associated with fishing and specifically pearl-diving. The 2 Zuijin (shrine guardians) located inside the Sumiyoshi shrine indicate that it was a more important shrine in times gone by. Just below the shrine is a monument to and the grave of Ohatsu no Kagamiyama, a local woman who is the main character in a well known Kabuki play, Kagamiyama. The story was written for Bunraku puppetry first and then later transferred to Kabuki, and concerns 2 of the most popular themes in Japanese stories, suicide, and revenge. The area around the shrine is great for wandering and is composed mainly of alleys and very narrow streets, with a lot of funky old buildings and interesting small temples. Some more architecture pics not from Japan. When I first saw this amazing building I was surprised to learn that it was in Birmingham, a fairly ugly city in the midlands of England. A little later I had to change buses in Birmingham so took the opportunity to take a few shots, but then went back to Birmingham about a year ago specifically to shoot it again. Designed by Future Systems, it opened in 2003 and houses a branch of Selfridges Department Store. The inside is not particularly interesting. My favorite shot is this one, shot through the window of the pedestrian tunnel that connects the store to the parking. There was a documentary on TV last night about Iwaishima, and it's prompted me to post this. This is Mr. H, a resident of Iwaishima, a small island off the coast of Yamaguchi. Mr H is 90 years old. I met him last year at the Kannmai Matsuri. In 1969, a mere 40 years ago, a little over 2,600 people lived on Iwaishima, now only 520 are left. Of those 520 a full 75% are aged over 65 years old. I had walked around on the island's only road to the far side to watch a ceremony. Yoko, with her bad hip, stayed in the village. It was a hot day, and Mrs H came out of her house and invited Yoko in to the house for some shade and a cold tea. While chatting Yoko told them where I had gone and they suggested that she borrow their bicycle and cycle round to meet me, and so it was as I was walking back I bumped into Yoko riding a bike that while not as old as the Mr H, was probably as old as Yoko. So, I sat in their cool house and sipped tea while Mr & Mrs H chatted about their activism in the fight against the nuclear power station planned for nearby. The majority of the remaining islanders are against it and big anti-nuclear signs are painted an a few walls around the village. The local shrine has been boycotted by the people because the priest is not against the power station. When we left their house they gave us a plastic shopping bag. In it was a pack of the island's green tea and a couple of packs of dried seaweed, a local speciality. I used to do a lot of painting before I got into making masks, so I thought I'd post a couple. This first one is titled Tanijyugo Anniversary, and I painted it to mark one year of living in Tanijyugo, so that must have been 5 years ago. This second one is titled Mononobe. The Mononobe were an old clan in ancient Yamato, but it is also a major shrine in Iwami. When I first visited it I was impressed with the chigi, the cross-pieces on the roof. Another element in my paintings is the shimenawa, the rope that marks sacred space. Both paintings are acrylic on paper, approx 38 cms. sq. Covered shopping arcades can be found in most Japanese towns. In the big cities, where most japanese now live, the arcades tend to be glitzy and are likely to have global brands such as McDonalds. In many ways they look like duty-free shopping areas in airports, and consumption as identity is prevalent. In the smaller towns, that continue to depopulate, the arcades can often be like a ghost town, with few people and many shops closed permanently. They tend to be funkier and have stores that sell local products and household goods etc. This short video is of a kagura performance on the small island of Iwaishima, or as some people say, Iwaijima, off the southern coast of Yamaguchi. If you compare it to some of the other videos of Iwami Kagura, you will see some differences. The music is different, and the costumes are much simpler. This is the first dance of 33 that were performed over a 3 day period as part of Kannmai Matsuri held every 5 years. The opening dance features Kojin, the local kami of the island, though the mask look a lot like a Tengu, or even Sarutahiko. Kojin is equivalent to the kami Omoto in my area, and is known as an Aragami, "rough kami", though I prefer turbulent kami. In this dance the priest pacifies Kojin. The priests come from northern Kyushu, which has its own kagura traditions, so I don't know whether these performances are from that tradition or the southern Yamaguchi kagura tradition. The masks are wooden, and so are simpler than Iwami Kagura masks. These are 2 of my versions of the Ashinazuchi mask. Ashinazuchi, most commonly translated as "foot stroking elder", was the husband of Tenazuchi, hand stroking elder, and the father of Kushinadahime. The only dance he appears in is Yamata No Orochi, most often the grand finale to an Iwami kagura performance. In the dance, Susano finds Ashinazuchi, Tenazuchi, and Kushinade, the last of their eight daughters, lamenting as they prepare to sacrifice her to the great 8-headed serpent Yamata no Orochi. In return for defeating the serpent, Susano gets Kushinada as his wife. The Yamata no Orochi story is a myth, but probably based on a legend, and legends are based on historical events. I spent 3 days walking along the Hi River area up in Izumo visiting many of the sites and shrines connected to the legend. This village in the valley below was the home of Ashinazuchi and his family. This is a geography textbook on Japan. Apparently there hasn't been a new one for a long time. From beginning to end it is crammed with facts, figures, and statistics. Of course on their own statistics can be quite boring, but the author manages to point to meanings that are illuminating. The book has hundreds of photos as well as charts, graphs, and maps. The maps in particular are clear and useful. 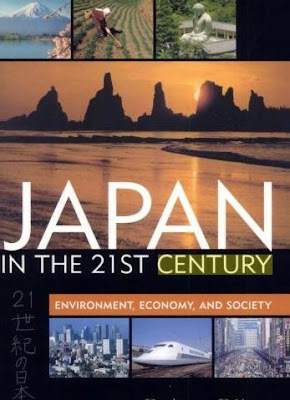 Being a geography book there are informative chapters on the physical nature of Japan, its landscape, geology, climate and weather etc, and a brief overview of the human history. Each of the regions of Japan are given their own section. The demographics and society chapter covers all of the pressing issues in Japan today,... the aging society, falling birthrate, immigration, etc. Politics, economy, industry and the post-industrial landscape..... it's hard to think of any aspect of Japan and it's society that isnt covered. A nice feature is sections called "field reports" where a particular aspect is studied in depth. If you only have time to read one book on Japan, then this would be it. I saw this mendicant monk in front of a shopping mall in Hiroshima. I believe he is of the Nichiren sect of Japanese Buddhism. I was intrigued by the interaction, and non-reaction, between him and the passers-by. Older peopled tended to bow as they passed him. Older people tend to bow when they pass a Jizo statue or a shrine entrance. The Japanese, more perhaps than any other people, have developed the art of not seeing what makes them uncomfortable to a high art. Homeless people, concrete mountains and foreigners are among the things often invisible. The first one is from my favorite viewpoint over the Gonokawa about 1k upstream from my place. I've posted more pics from the same place. I'm not a meteorologist, so I'm not sure exactly what the difference is between cloud, fog, and mist. They do say that the tea grown here has a particularly fine taste due to the bushes being kissed by the river mist. This abandoned " Rabu Hoteru", love hotel, is on Route 9 just outside Yamaguchi City. For anyone who doesn't know about love hotels I recommend a brand new book by Ed Jacob, Love Hotels: An inside look at Japan's sexual playground. At $10 to download a pdf it's certainly affordable. Obviously, for someone at least, "Eden" is located in the Mediterranean (or a Mexican shanty town). In my area all the love hotels are located outside of the towns, and while a few are painted a bright color to make them visible, many are simple, innocuous, drab places composed of individual "cabins" more akin to motels. There are none of the outrageous architectural palaces that one sees in the cities. Like most Japanese construction, they are cheaply built, and combined with japan's humidty and precipitation it doesn't take long for buildings to become derelict and decompose. The sign tells that the room is temporarily unavailable due to it being cleaned and prepared for the next customers.